I now actually have Pin-Dog mostly done, so figured I would start a build thread for those instant gratification users like myself that can't wait while a project is being worked on. Initial concept was a very slim budget build with a used computer from work and monitors from craigslist. Well feature creep set in and I added to the build smart power strip, nudging, 3rd monitor, SSD and the work computer wasn't available so built a new one. Still ended up at around $600 total. Radeon R7250E video card to drive all three monitors. 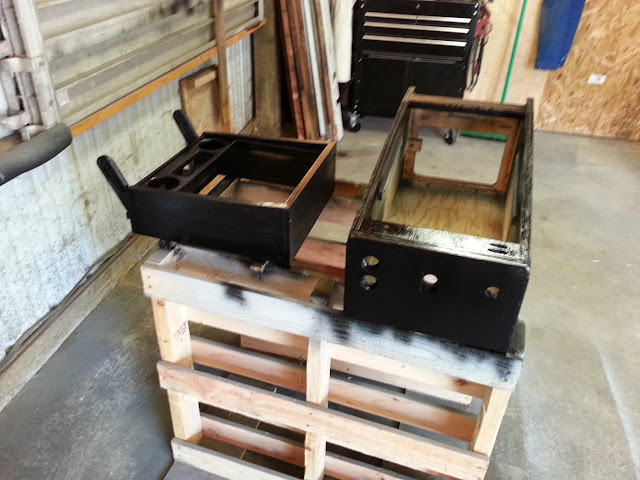 Cabinet materials were all wood, metal, and plexi scraps I had on hand except for the aluminum side rails. 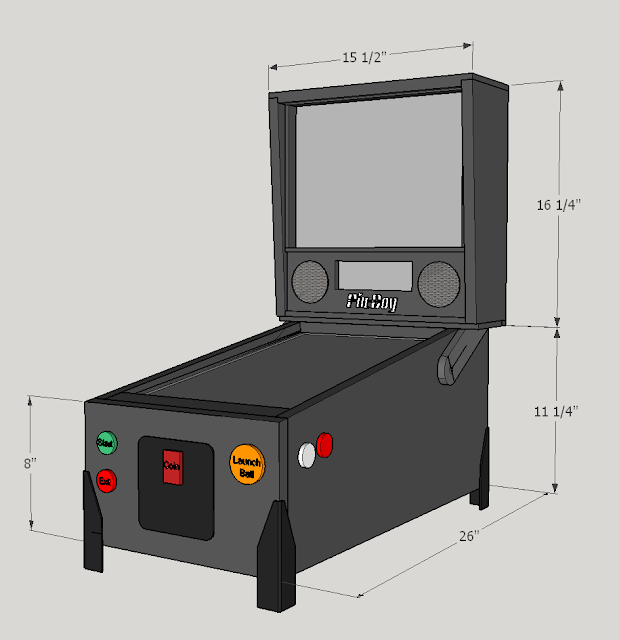 The design had to be changed a little from this as I built it, but this is the main dimensions and design. The design was done in sketchup around the dimensions of the monitors I had, and one of the changes came a little into the process when i decided to decase the back glass monitor after switching monitors for one that had a DVI input, which was prompted by adding the little HDMI monitor for the DMD. As I am fairly comfortable with wood working I started there, but I'm not so good with pictures so a lot of steps will be missed. 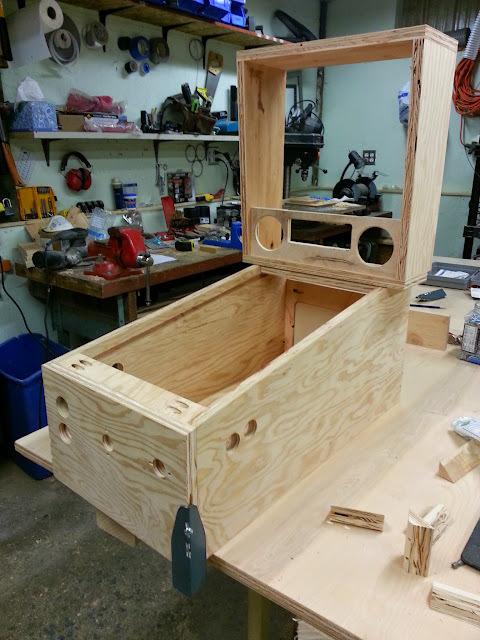 First test fitting of the buttons in the base cabinet held together by the one clamp. Note, the nice plywood it is sitting on is actually for some cabinets I'm building for our laundry room, Pin-Dog is made from mostly 3/4" ACX that I had leftover from other projects. And the first trial fit of the LG monitor. 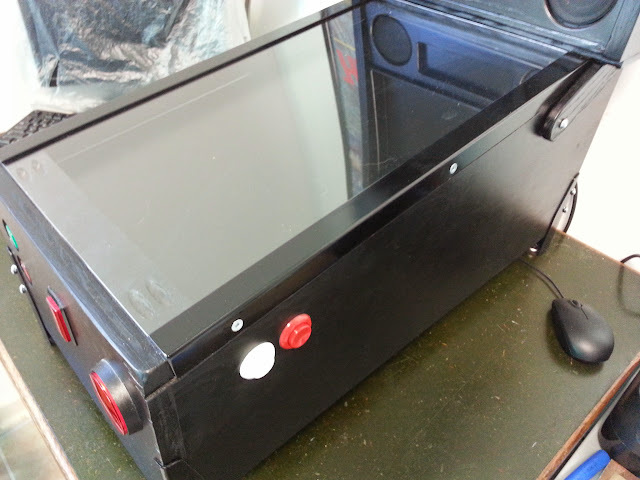 This monitor had really small bezels and was 1/2" to 5/8" thick so I did not decase, but put a dado 3/8" into the sides to slide it into from the back. So, just a little history on the name of my cabinet, Pin-Dog. My username here, and pretty much everywhere else is BorgDog. I originally took that name in the 90's as a mashup of "the Borg" of Star Trek TNG fame and Dogbert of Dilbert fame. Since then most of my computers have been named with a dog theme. My current Thinkpad Yoga is named DownDog, my home theater PC is named RinTinTin, so not having much imagination I could only come up with Dog-Ball or Pin-Dog for the name, and Pin-Dog won out. I'm playing around in Photoshop to make my own dmd animation for the cab as well. I'm not very good with photoshop but here is what I've come up with so far. I love thse mini ones! Very awesome. I want to make a mini one day. Thanks for the kind words guys. Part of the idea with going mini is so I can bring it to my cabin in the mountains.. of course I thought of building 2, maybe someday. Being portable and also cost was another factor, small screens smaller price. Here's a few more shots of the progress. 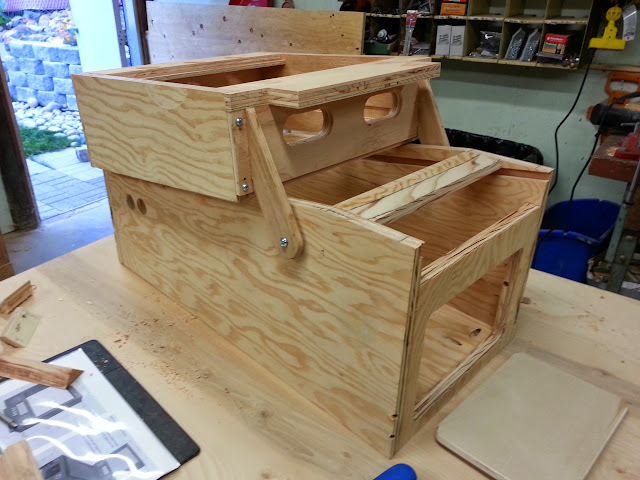 Here I have the box assembled with pocket screws and am test fitting my mini-leg made from a piece of old bed frame. All of the back box pieces are just balanced there in this shot just so i could get an idea what it would look like. 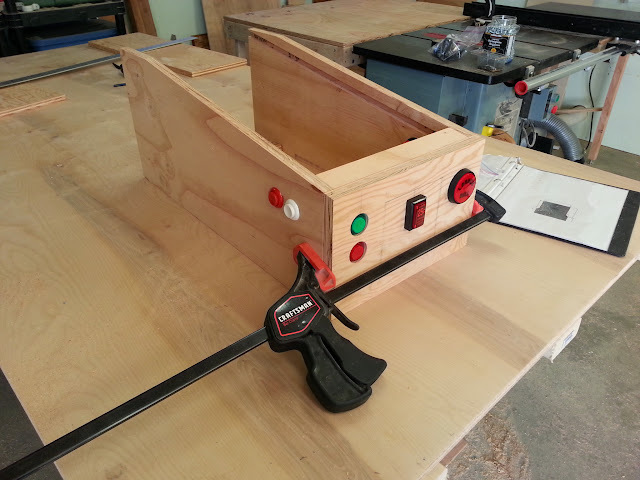 Before I fully assembled the back box I had to figure out how to attach the hinges which I made out of some scrap oak run through the surface planer to get it around 7/16" thick. 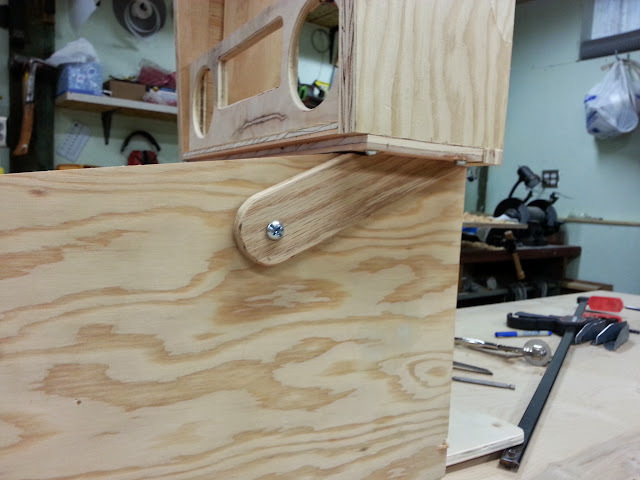 I don't have any pictures of it, but the hinge part goes up through the bottom of the backbox and is screwed into the bottom and side of the back box. And here it is folded over, which also shows how I extended the back of the back box down to leave an opening when folded to slide the playfield monitor in. And here it is with all the monitors and the speakers fitted. 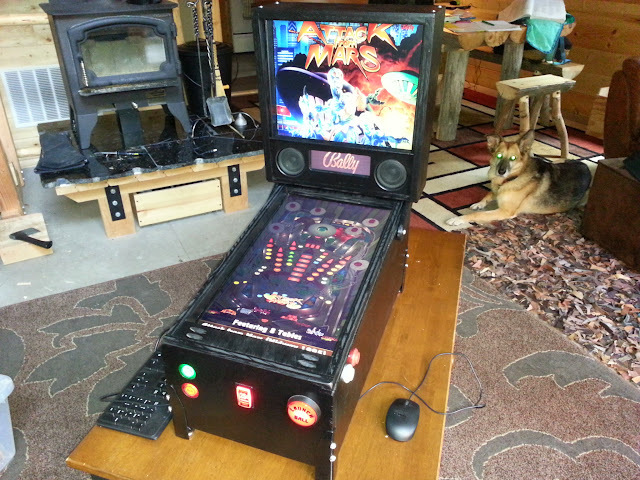 Now that everything was pretty well set, I added a few trim pieces around the backglass monitor to hide the edges there, and a real small one on each side of the playfield monitor to do the same. Then it was on to painting. 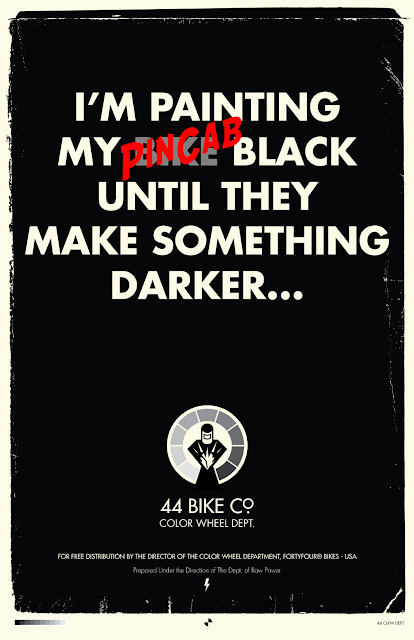 So to borrow a poster/saying from one of my other favorite sites Garage Journal and 44 Bikes who posted the original "bike" version. If you are into hand built bicycles or just seeing how they are made, or really cool shops, check out Kristofer Henry's thread HERE.The guy is simply amazing. I took out my trusty rattle can's of Krylon and went to town. Satin on all the wood work and gloss on the legs and side rails. 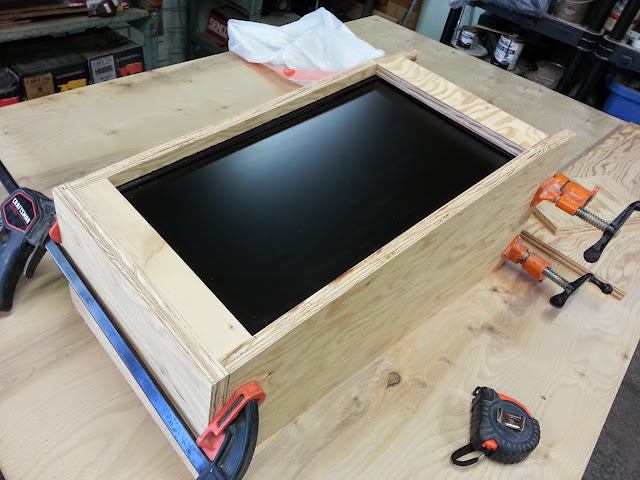 While that was drying I finished cleanign up the playfield monitor for mounting. This particular LG had the control in the base and capacitive touch controls. 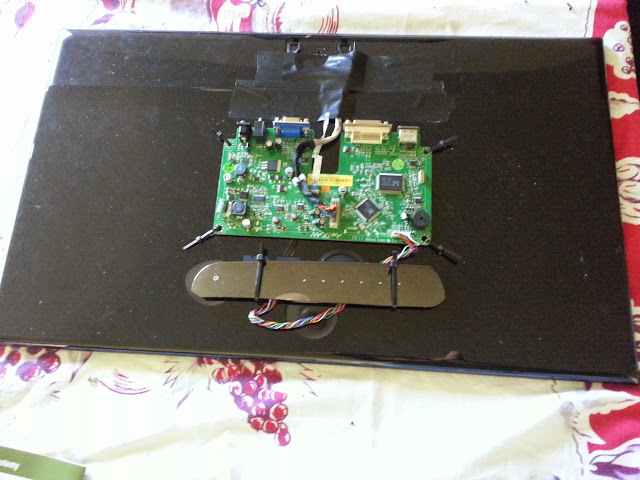 I took apart the base, and simply drilled holes through the snap off plastic back of the monitor and zip tied the control board and controls to the back. Edit: found the model number Flatron E2281. And my last picture until I get back from a weekend at the cabin. All assembled and ready for the guts. I even had 2 extra locks for the doors on the back that are keyed the same as my mailbox and the toolbox on my truck, the less keys the better and I always carry this one on me. 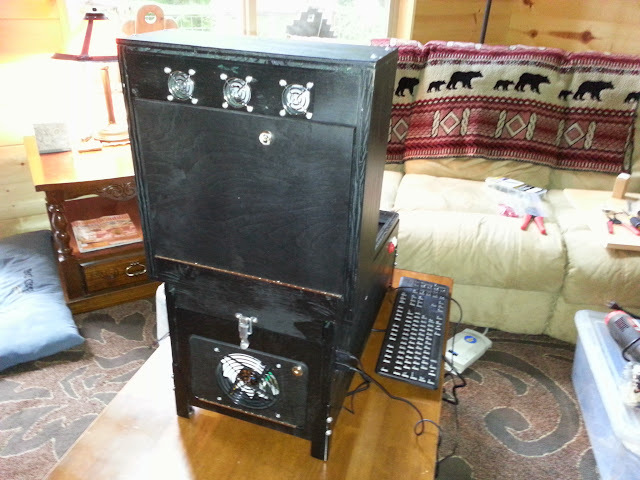 I thought of putting a fake coin door on the front to go with my fake coin button, but in the end I decided that a 5"x5" door really wouldn't allow me to do anything inside and would be a lot of extra work to make it look how I wanted (had some scrap diamond plate aluminum I was going to use). Edited by BorgDog, 03 October 2014 - 01:25 PM. Edited by sliderpoint, 03 October 2014 - 03:45 PM. LOL I'll try to do better on the next one. 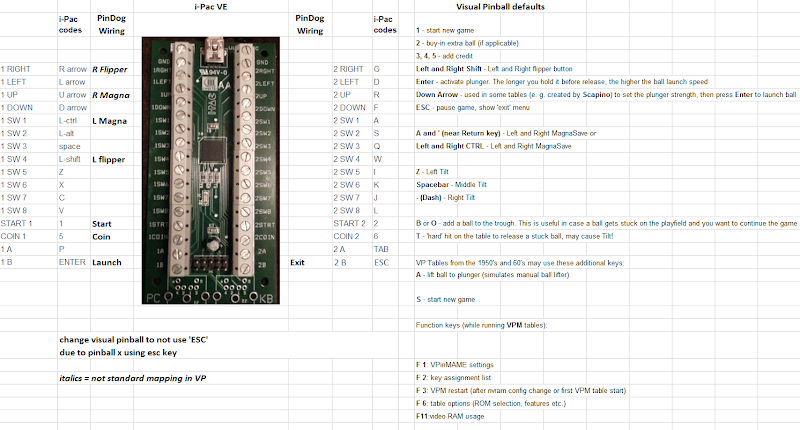 Just thought I'd share the little chart I made up in Excel on how i was going to wire my Ipac ve, and as a reminder for what I needed to change. Instead of programming the i-pac I decided to just change VP and pinballX to use the i-pac defaults. so far seems to be working OK.
Edited by J3SteR, 04 October 2014 - 03:54 AM. Brought Pin-Dog with us up to the cabin this weekend, and between chopping firewood and cutting up fallen trees I got a little work done, mostly on the software end. 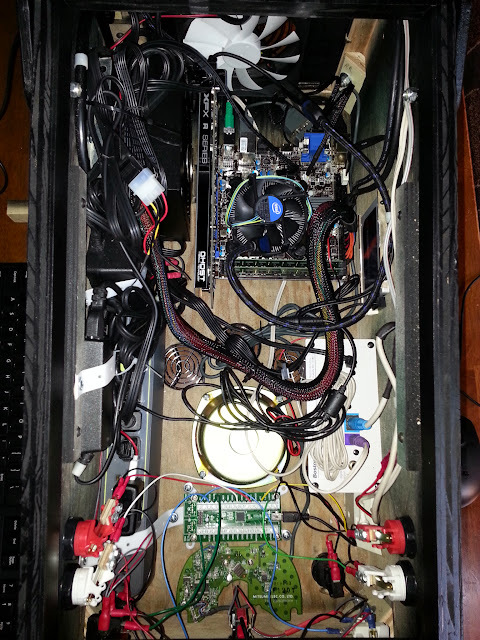 To catch up with things, here are a couple shots showing the guts, first from the top with the playfield removed, and then through the little back door. Part of what I did this weekend was shorten a bunch of the cables to clean things up a bit, still have more to do, especially with power cables that you can see in the upper left of the top down view. you can also see where I mounted the freestyle pro I'm using for nudging in the front along with the i-pac. the SSD is barely visible mounted to one side wall on the right of the cab. That is a 140mm fan in the back, and you can make out some bottom intake holes in the top-down pic above. I love it! Nice work. Here's a closeup of one of the legs mounted. 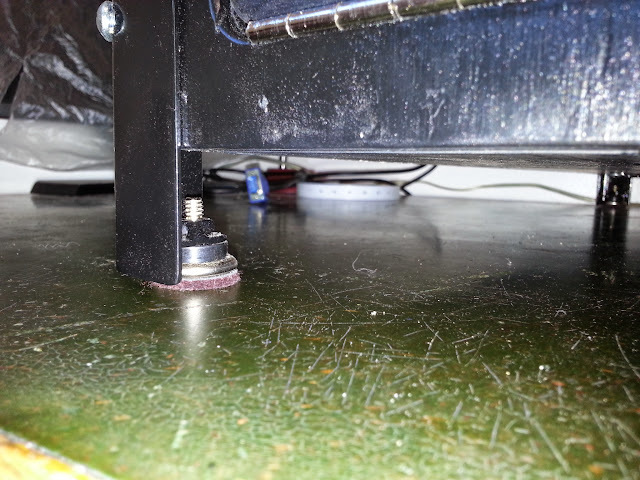 Basically a 1-1/2"x1-1/2" angle iron from an old bedframe with a tab welded onto the back up about 1/4" from the bottom, then drilled a 3/8" hole through the tab, then welded a 1/4" nut onto the backside that was held in position by a bolt through the hole. I set it up this way so the adjustible leg would be pretty much hidden from view once I put a felt pad on it. I think it turned out close to the vision in my head. Today I decided I wasn't going to be taking the screen out again for some time (I hope) and that I could put the "glass" and side rails on. the glass is actually some 1/8" plexi that I had left over from another project (thien seperator) that I cut to size and drilled and countersunk 3 screws along each side. It does flex, but no where near enough to hit the monitor and should be sturdy enough. side rails made from 1"x1"x1/8" aluminum from the hardware store, painted black of course. 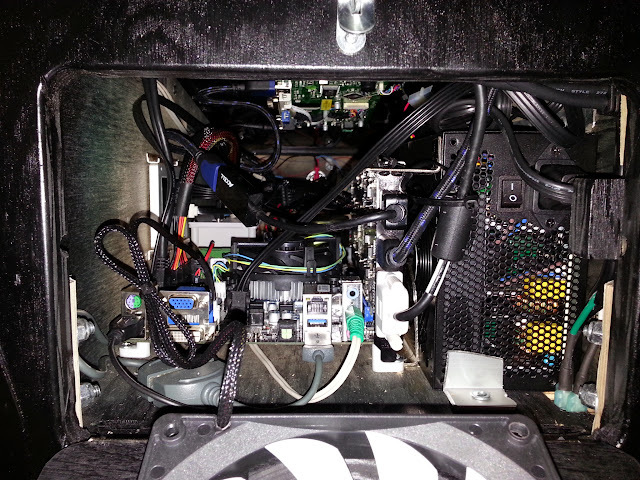 And here is a shot showing the 2 usb 3 ports I sunk into the left side toward the rear. 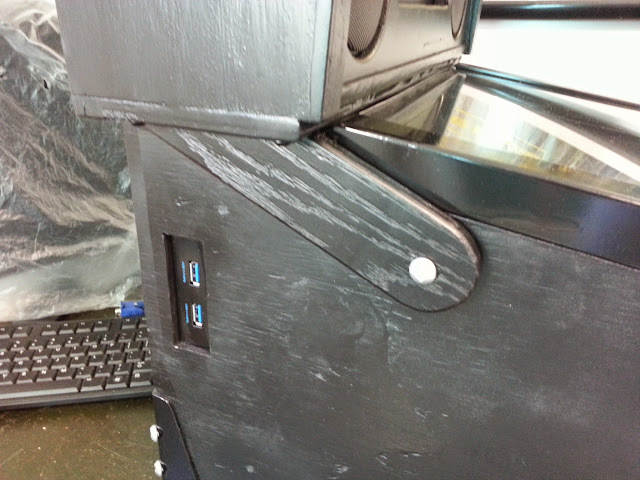 It is actually a mount for a front panel 3.5" opening that I cut down, and connects directly to the usb3 header on the motherboard. Still need to fab up something for a lockbar, may try steel, likely end up in wood, we'll see. May try to steal Findusone's backlit logo idea (MONSTER) In the mean time I'm adding more tables and getting them configured and playing, and playing some more Still need to tweak my nudging a bit, but overall very happy with the almost finished product. I think everyone is planning on stealing his logo idea lol. But seriously love your cab! 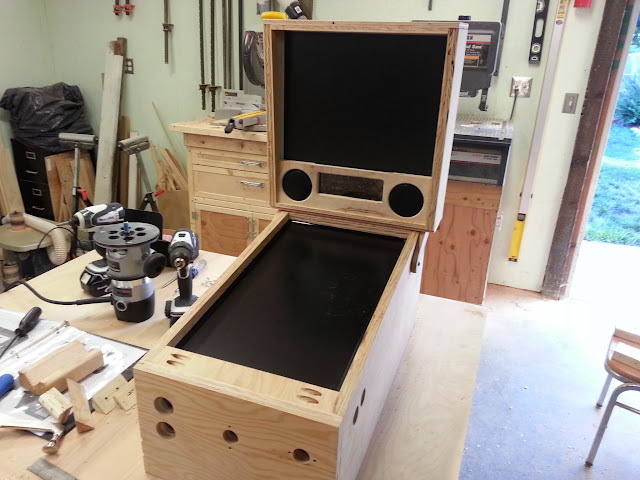 Thanks Borgdog for posting your build. 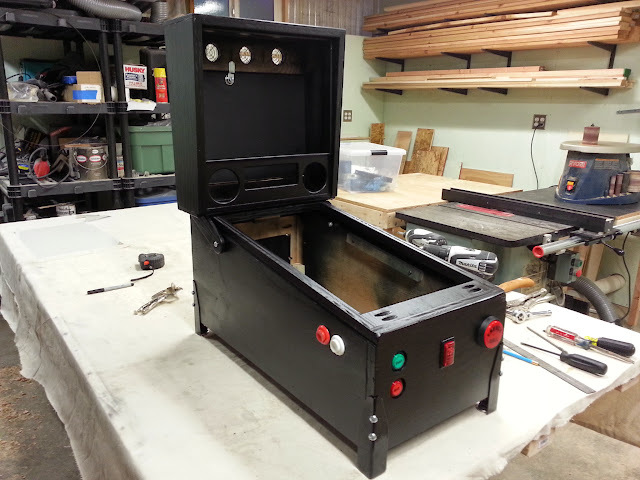 I want to start my first cabinet build and am glad I found this thread. Like you I don't want to build a full size cabinet, but a table top like yours. thanks J3SteR and snafu. It's been a lot of fun building it, Having fun playing it too and setting up the tables so they look and feel right to me. One thing I have found with the mini pin and motion nudging is that I can get a LOT of motion of the cab if I'm not careful. Felt feet pads on a smooth desktop probably don't help, and I may try it with rubber pads to see how that feels, but I can easily "nudge" it 6-8" across the desk if I get a little excited. I look forward to seeing what you come up with snafu. But I bet it still doesn't tilt..
Actually if I do it enough it does tilt. I haven't tweaked those settings yet to make it more "tiltable" but I have gotten it to tilt by shaking it around quite a bit after reading about others issues with that. This is a PinCab like i had in mind for myself... Very nice!